For their first Christmas away, they sent a box of presents to be unwrapped on Christmas morning. We all received handmade native moccasins and gloves - fully lined and trimmed with rabbit fur. There was one present, however, that Jo-Anne instructed me to keep until all the gifts were unwrapped. It was for Mom. As she tore the paper off the gift, her eyes welled up with tears. 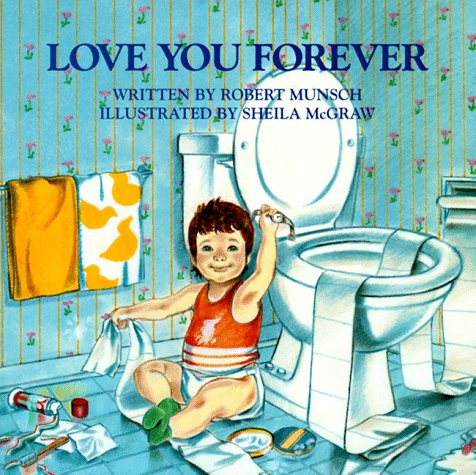 It was the Robert Munsch book "I'll Love You Forever". She tried to read the book to the rest of us, but the tears were now spilling over onto her cheeks and she just couldn't do it. Steve ended up taking over and reading the book for us as we all sat weepy and missing our first sibling to leave the nest. Looking back, I really admire the courage it took to move so far away from home. During their time in Manitoba, Jo-Anne taught herself some awesome cooking and sewing skills. It was tough having them away, but great having them back. I just cried in Starbucks while reading this post! I am loving these 12 days of Christmas posts, Janice!